Recently I was commissioned to make a whole cloth quilt for a client. She wanted a baby quilt with hearts and flowers on it. Since she already knew the name and gender of the upcoming birth of this baby, I suggested we put her initial in the center. So I got out my big paper and started designing actual size. I drew a heart using a template I had and enlarged half of it on my printer and kept enlarging until I got it to the size I wanted. Since the heart is the center of this quilt it was important for it to be somewhat symmetrical. 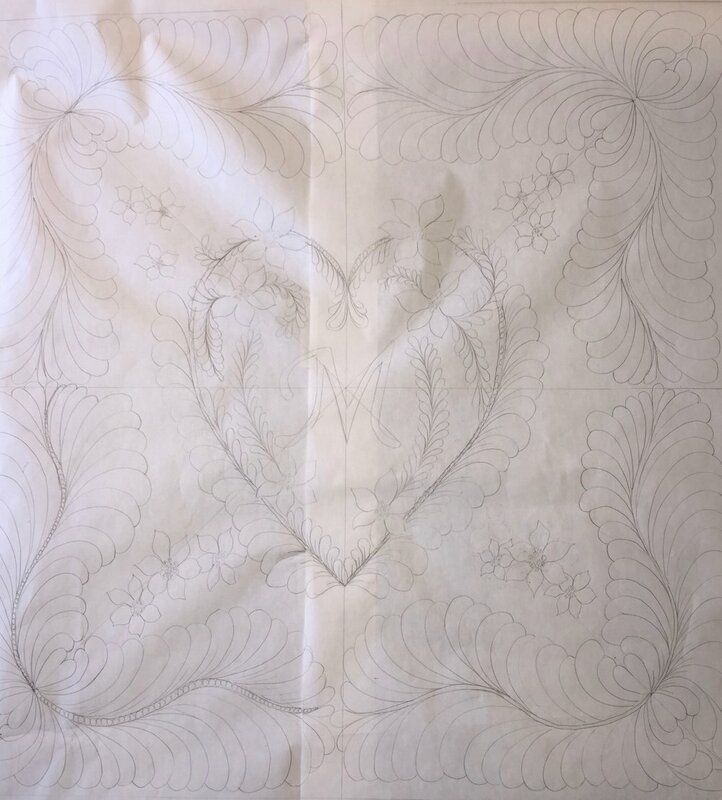 Once I had the heart centered in the middle of the paper, then I could add the flowers and feathers to create the likeness of a heart, but not the hard lines. It was important to have a few hard lines of the heart, especially at the top. After that, I just added feather vines in the corners and measured to make sure they were placed properly and symmetrical. Then I just played with my pencil to draw in the details until I was pleased with the look of it. 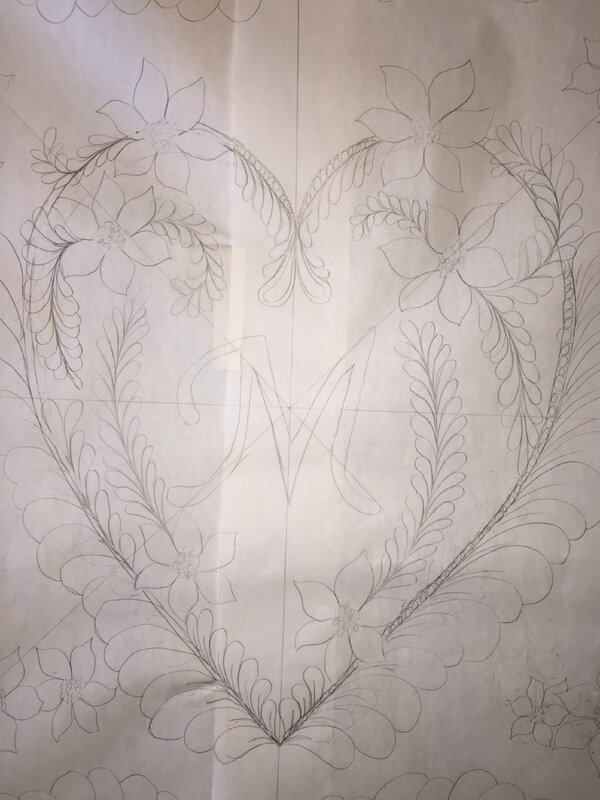 The next step was to trace the design onto the fabric. Since the fabric was white, it was easy to see my drawing underneath. I used a water soluble pen to trace the backbones of the feathers and the petals of the flowers. The rest I did not trace because I felt comfortable enough to do everything else free hand. I also drew hard lines for the perimeter of the quilt so I knew where the outer edges were. Once all the large feathers and hearts were in place, then I went back and filled in the background to make those things "pop" off the page. I did very dense quilting inside the heart. The most important thing is to have the scale of the background much smaller than the motifs so they will stand out. I have found (myself included) that many quilters do not pay enough attention to scale so the image is not that effective. As I moved out from the heart, the background could be a little less dense but had to remain smaller than my smallest motifs (the flowers). Then on the outside of the large feathers creating the border I could go a bit larger there. After the quilting is done, the quilt was spritzed with water to remove all the markings. Once the quilt was inspected for any errors and corrected, it was removed from the frame and carefully trimmed to be square and have an even amount of quilting around the outer edge. Binding was applied and it was complete. I hope you enjoyed my process here. I really enjoyed making this quilt. Now I'm motivated to make a bigger one!